They say there was or there wasn’t in olden times a story as old as life, as young as this moment, a story that is yours and is mine. Once in a Promised Land is the story of Jassim and Salwa, who left the deserts of their native Jordan for those of Arizona, each chasing mirages of opportunity and freedom. Although the couple live far from Ground Zero, they cannot escape the dust cloud of paranoia settling over the nation. A hydrologist, Jassim believes passionately in his mission to make water accessible to all people, but his work is threatened by an FBI witch hunt for domestic terrorists. A Palestinian now twice displaced, Salwa embraces the American dream. She grapples to put down roots in an unwelcoming climate, becoming pregnant against her husband’s wishes. When Jassim kills a teenage boy in a terrible accident and Salwa becomes hopelessly entangled with a shadowy young American, their tenuous lives in exile and their fragile marriage begin to unravel. Once in a Promised Land is a dramatic and achingly honest look at what it means to straddle cultures, to be viewed with suspicion, and to struggle to find safe haven. “Set in the early days of post-September 11 America, Once in a Promised Land draws its structure from Arabian folklore and the western fairy tale, turning both inside out to illuminate the mythic search for home and identity, the universal hunger of the soul for the genuine, and the wounding yet redemptive nature of love itself. 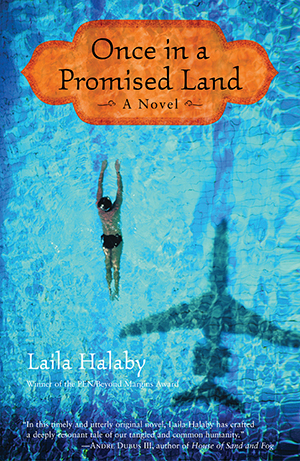 In this timely and utterly original novel, Laila Halaby has crafted a deeply resonant tale of out tangled and common humanity. Named one of the 100 best fiction books of 2007 by the Washington Post. Chosen as a community read for the city of Port Townsend, Washington. Salwa and Jassim find themselves surrounded by hostility after the attacks on the World Trade Center. Did you notice a change in attitude towards Arabs in the U.S. after 9/11? Are there other groups in your community that are discriminated against because of their ethnicity or religion? Have you ever been subject to discrimination? Jassim kills a teenage boy in a car accident. What would your reaction be if you hit and killed someone? Would you go visit the victim's family, as Jassim did, or avoid them? What if you were the parent of a child who was killed in an accident-would you want to meet the person who was responsible, even if accidentally, for your child's death? Salwa doesn't tell Jassim that she is pregnant. Why not? How would you have handled this situation? Halaby tells the story from two very different points of view: Salwa's and Jassim's. Is one of them more compelling for you, or easier to identify with? Do you find that at different times in the story you are sympathizing or siding with either Salwa or Jassim? Every aspect of Jassim's life is splitting apart: he kills a boy in a car accident, he gets fired from his job as hydrologist, and his wife is becoming distant and secretive. How does he handle these three crises? If you were in his place, would you have done anything differently? Can you think of a time in your own life when you had to deal with frustrating circumstances that were outside your control? Marcus, Jassim's boss, fires Jassim because his clients are scared off by the FBI investigation and the company is losing contracts. Marcus knows that Jassim is the innocent victim of a witch hunt, but lets him go nonetheless. Do you think he did the right thing? What else was nagging at Marcus? How would you have dealt with the situation if you were in Marcus's place? How does Salwa get drawn into the affair with Jake? Can you identify some of Jake's traits or qualities that she is attracted to? Why can't Salwa see the negative side of him that is so obvious to other people (Petra and Randa for example)? Compare Salwa's affair with Jake and Jassim's relationship with Penny. Are Salwa and Jassim looking for similar things in their extramarital relationships? What is missing in their marriage that they are seeking elsewhere? Salwa's friend Randa, to whom she confesses about her affair with Jake, advises her not to tell Jassim, "no matter what." Would you have advised her differently? Arab culture is an integral part of Salwa's and Jassim's identities, and even though before 9/11 their life in the U.S. is quite comfortable, it is inevitable that at times they feel misplaced and yearn for the sense of belonging and the warm familiarity of their homelands. Can you point to specific instances when Salwa and Jassim have to reconcile the differences between the Arab and the American cultures or lifestyles? Have you ever had to negotiate between your own culture and a foreign one? When Jake cooks dinner for Salwa, he offers her candy-coated shumur (fennel), which "brought back desserts eaten only during Ramadan, brought back home in one tiny burst and then another" (p. 209). Does shumur remind you of Proust's madeleine? Can you point to other things (rituals, flavors, etc.) that "bring" Salwa back to her homeland? If you were away from your home, what would be your shumur? What do you think happens at the end of the novel? Is Salwa dying? Are they reconciled? How do you interpret the folk tale?